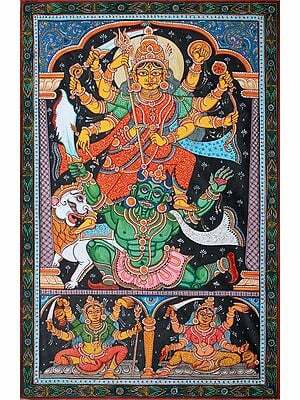 Patachitra or the icon paintings of Orissa occupy an important status among the many art forms centered around the temple of Puri. 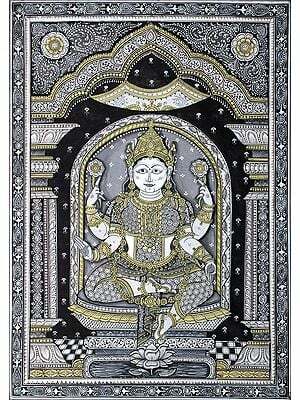 For the painted surface, the chitrakar community of painters utilises a gauze like fine cotton cloth, coated with a cooked solution of powdered tamarind seed, chalk and gum and subsequently smoothened. The paintings are executed primarily in profile with highly elongated eyes within a floral border. There are few landscapes and the scenes are depicted in a foreground closely juxtaposed together. Highly stylized paintings of the Puri temple and scenes from the epics, Ramayana and Mahabharata, figure along with the predominant painting of Lord Jagannath, a form of Krishna, with his older brother Balarama and sister Subhadra.